It happens to even the best. 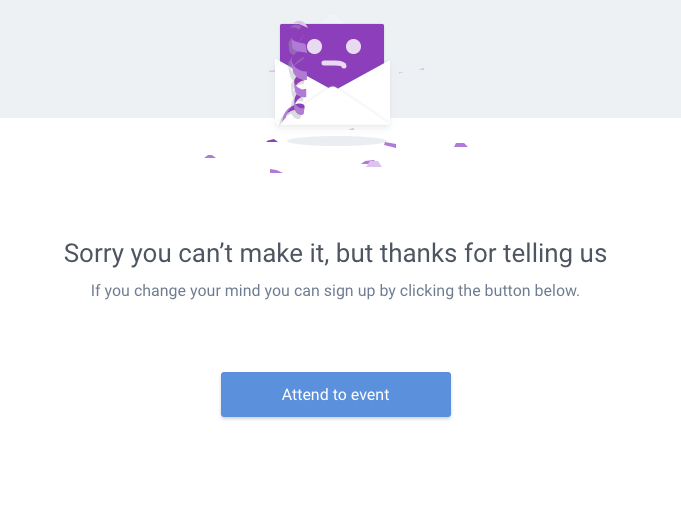 We hope you never need to cancel an event, but sometimes the sign up's don't go the way you've planned. In that case, we think Upsales should handle cancellations smoothly. So sorry, you can now cancel your Events in Upsales. When doing so, your event forms are locked from further submits, and your automated emails are paused. You can of course send emails to notify the one's that already signed up. In this release, we've focused on handing more information about the lead to the team member who's been assigned. When you're assigning a lead for a team member you can now select which contact they should approach and add some notes. These both show up in the assigned activity for your team members. We've also completely re-designed the email you receive when you are assigned to a lead. The email now includes a lot more useful information. 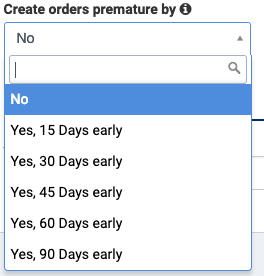 You can now choose to create order 90 days in advance for your subscriptions. We also support 15, 30, 45 and 60 days before. To activate this function if you don't have it, go to Settings/CRM/Subscription and select Show field for early creation of order. We now support multiple timezones and currency formats. For example, you might work in Sweden but like to see date and currency in American format. Simply head over to your user profile and set the language and region settings. If you install apps that are dependant on certain stages or fields in Upsales, your users can't delete those fields or stages without getting notified. This means that integrations that have dependencies will not stop working because of missing fields or stages in Upsales. The app needs to be uninstalled or reconfigured before the dependencies can be deleted. In order to be successful in the global market, you need to be able to process new countries and regions effectively. With Bisnode international, you get access to the worlds most comprehensive company database with more than 350 million companies. Find new customers all over the world and enrich company data with revenue, number of employees, turnover, company status and much more. Enable monitoring to a customer to get automatic updates. Get deeper insights with data like employee growth rate trends, revenue trends, stock exchanges, company family tree and much more. Bisnode International is a premium app that you can install in your account from our App Directory. Available for all Upsales Versions. Contribution margin (CM), or dollar contribution per unit, is the selling price per unit minus the variable cost per unit. "Contribution" represents the portion of sales revenue that is not consumed by variable costs and so contributes to the coverage of fixed costs. We release event in November 2018 and during January we have added a lot of new features for our Event users. When you remind attendees the day before your event you will always get a lot of emails from people that for some reason can't make it. We wanted to eliminate this unnecessary administration and added support for attendees to let you know that they can't make it by themselves. It's always someone that's going to show up to your event that's not on your attending list. You try to remember their name to add them to your CRM after your event. We have solved that for you as well. When you check-in your attendees with Upsales check-in feature you can now add additional guest in the app. What about the rest of the contacts that are interested in your event? 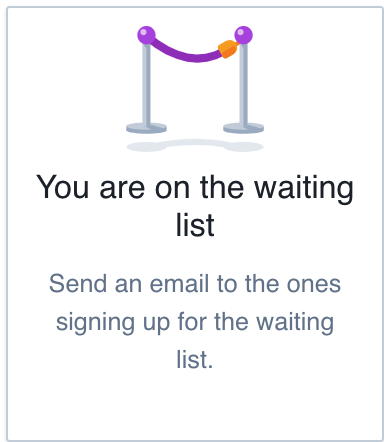 With our new feature, you can enable a waiting list where contacts can sign-up and get notified from you when/if seats get available later on. When a guest signs up for the waiting list they will receive an email confirming that they are on the. list. You will find all the contacts that's on the waiting list in your event in Upsales. Upsales Event has had a small but significant update that will help you manage your events. Before, to see your events you had to click ‘Events list’ and scroll through to find what you needed. Not much fun, and usually took some time. 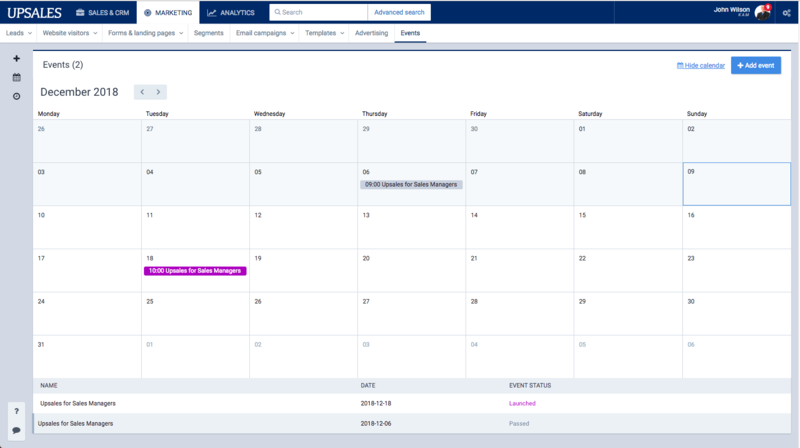 Now, when you click ‘Show calendar’, you can instantly see where all your events are. These are color-coded; purple means future event, grey means past to help you find what you looking for. Running your B2B events just got a whole lot easier. 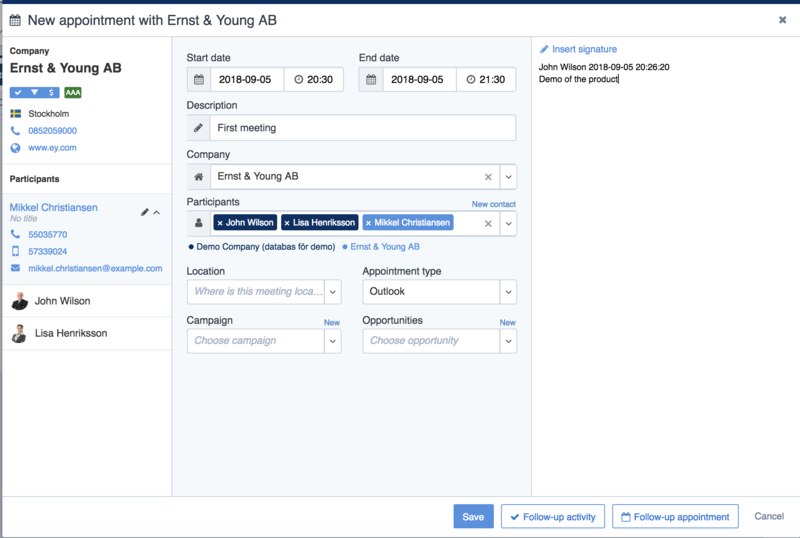 Upsales Events is now aligned with your Upsales CRM and marketing automation platform, adding new dimensions to your data. No more guesswork or communication breakdowns – instead you get the insight you need, before during and after events. Your messaging can be even more bespoke, segmented and at scale, with automated emails, landing pages, sharing tools, check-ins, guest list creation, and SMS functions. 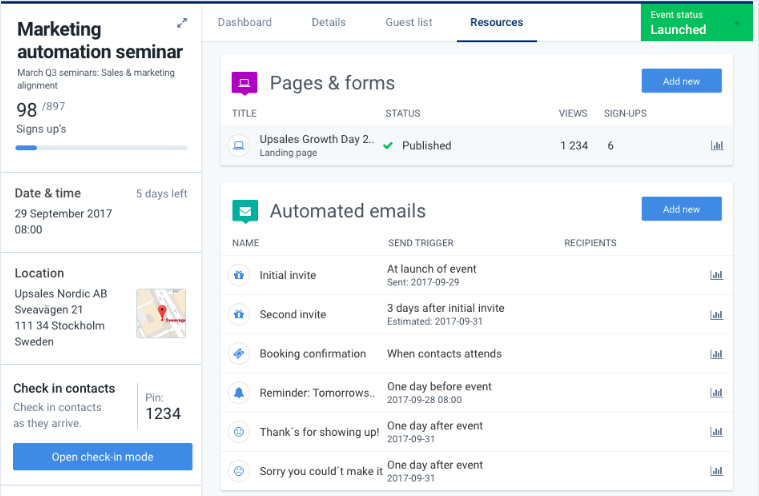 Having the platform connected with Events puts all the data in one place, helping to make things super-simple when it comes to nurturing attendees. Read more about Upsales Events in our knowledge base here. For all Upsales customers via this link. Want to reduce risks from third-party sites, lessen password fatigue, and cut the ‘Help I’ve forgotten/lost my password’ queries to IT help desk? Of course you do. So read on, this release is for you. 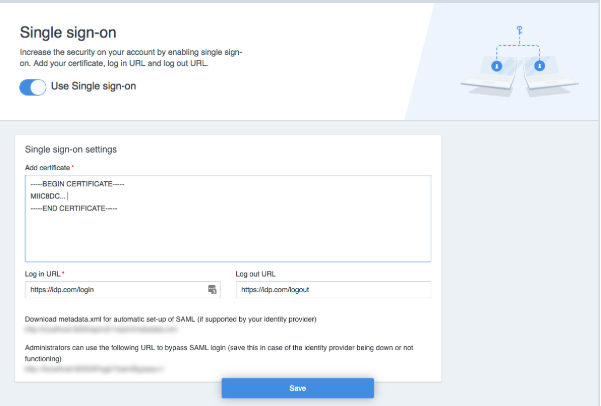 You can now get SAML 2.0 support on Upsales. That means authenticating and authorizing users via Single Sign-On, for multiple apps and services, including Active Directory or DUO Security. Read more about Single Sign-on in our knowledge base here. When you send out 1-to-1 emails from Upsales, you might want to have an email signature attached when composing and sending your email. When creating a new signature from settings/CRM/Mail signature, we provide you with a dynamic template based on your company profile. Things like your company logo and the company visiting address are dynamically rendered. 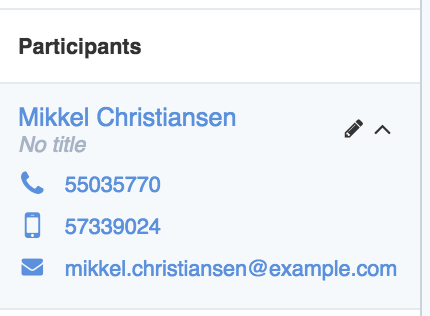 We also attach dynamic tags for the current user's name, title, and cellphone. This means that one signature will fit all your users. If you rather want to start from scratch, simply select all text and hit the delete key. We have provided you with a text editor so you can design your own email signature. You can have multiple signatures. This could be useful if you have different departments that need to display different content. You can also set one signature as default. 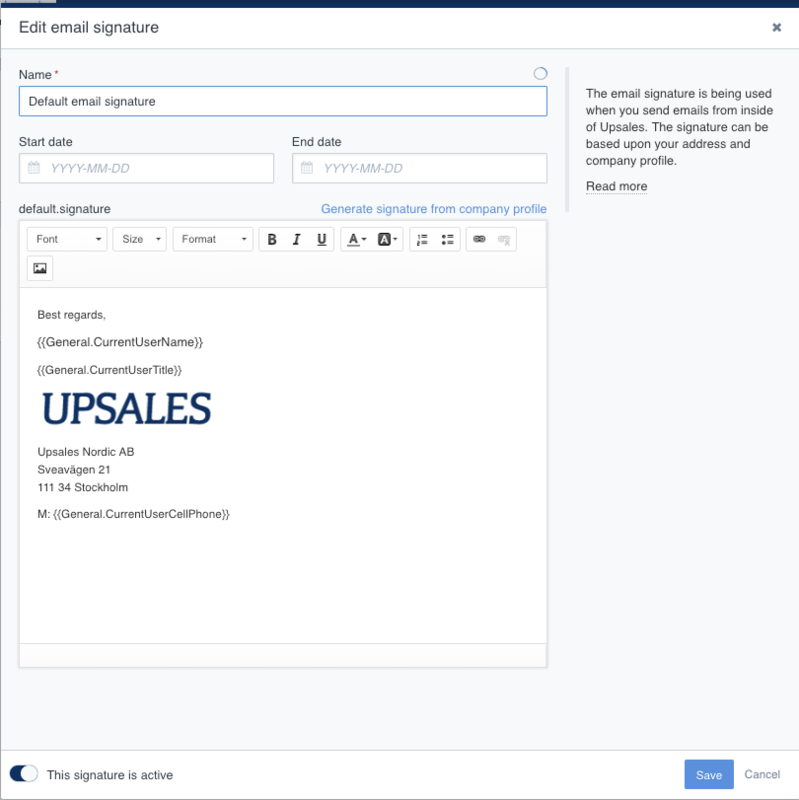 This means that each time you compose a new 1-to-1 email from Upsales, the default signature will be attached automatically. Start and end dates can be set to the email signature. This can be useful if you want to promote a special event or a new product somewhere in the signature. The signature will be inactive until the start date occurs even though the signature is set as active. The app is free to use if you are customers of both Upsales and Promoter.io. Want to know what your customers really think? Want to spot trends, predict patterns and fix problems before they cause lasting damage to your business? The app is free to use if you are customers to both Upsales and Promoter.io. Upsales NPS helps you collect authentic customer feedback, so you really understand how your organisation is performing. It's a way of recording what your customers think, their satisfaction levels, and whether they'd recommend you. Connect Upsales with Promoter.io to sync contacts from Upsales to Promoter and start sending out NPS surveys on a regular basis. NPS answers will be displayed on company and contact card inside Upsales. 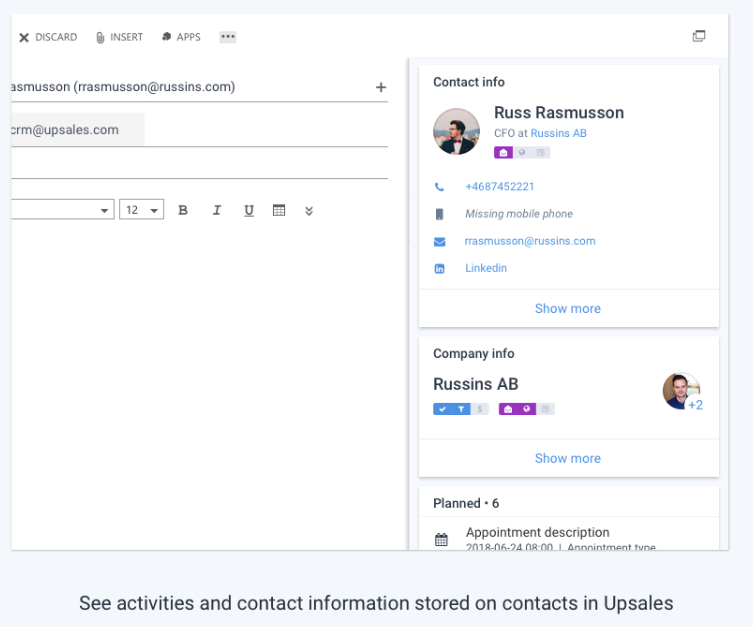 Upsales integrates with Promoter.io so you can sync contacts and easily ask for feedback on a regular basis. The NPS results are automatically added to your Upsales data, giving you dynamic insight to respond in real-time, and identify upwelling and cross-selling opportunities. Plus because contacts are synced, removing from Upsales also removes from Promoter.io, saving you time and helping keep your data clean. You’ll see the NPS in a widget next to an Upsales company card. If more than one contact has answered your survey within 12 months, the NPS is calculated by averaging each score. Create a segment inside Upsales with your target audience for you NPS survey. Contacts in your segment will be transferred to Promoter automatically on a regular basis. 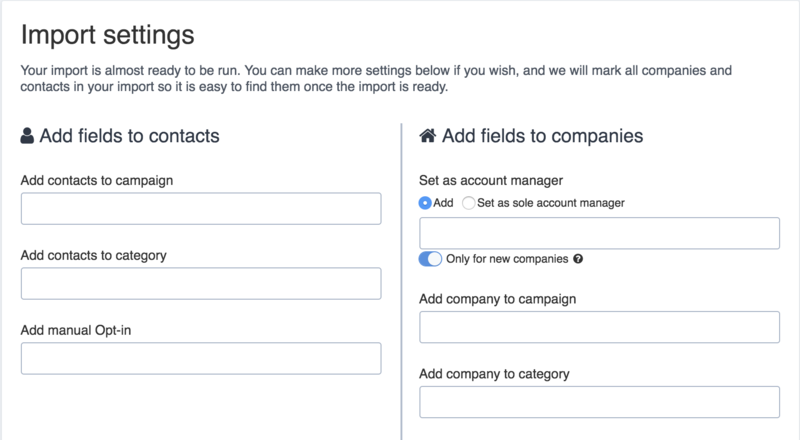 If contacts get included or removed from a segment after the integration started they will be added/removed from Promoter. We will display a widget on the left side in the company card if we can find NPS responses from contacts on that specific company (match on the company Upsales ID). If more than one contact has answered the survey we will take an average score for the last 12 months. You can dig deeper to see more information about what the respondents have written when they answered your NPS survey. We will display a widget on the left side in the contact card if we can find NPS responses from this contact (match on contact Upsales ID). You can dig deeper to see more information about what the respondents have written when they answered your NPS survey. 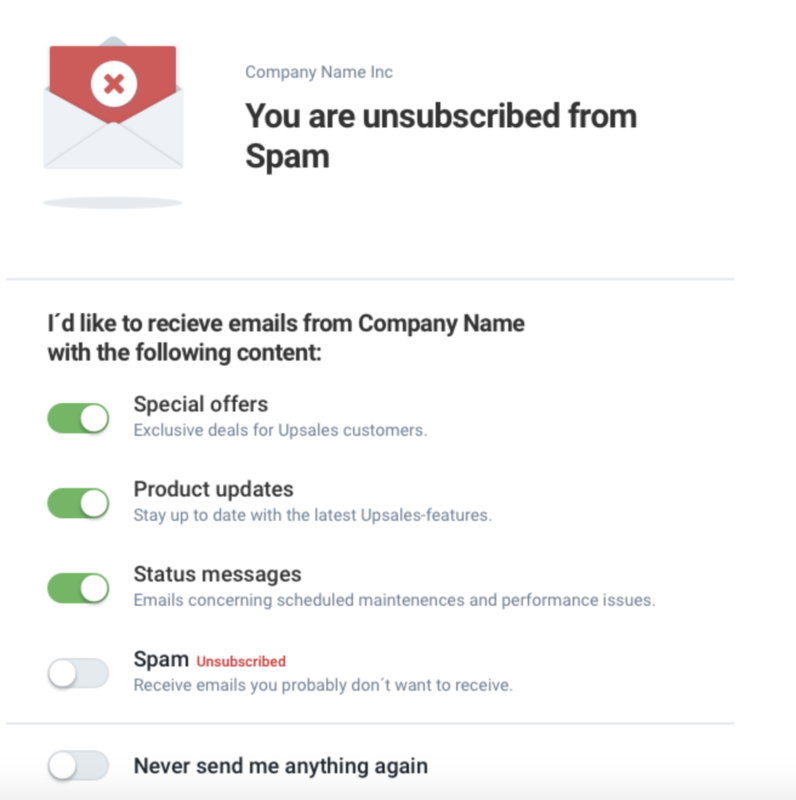 The new unsubscribe lists feature helps you keep more of your contacts subscribed for longer. Instead of contacts hitting your ‘unsubscribe’ link and you losing them forever, they can now unsubscribe from specific campaigns. They get more control, and you reduce your churn rates. Win win! When contacts choose ‘unsubscribe’, they have a choice about which lists to unsubscribe from. Upsales tipsAdd a description next to each list, explaining why it’s useful. And try to keep your lists as few as possible. Present too many options and most people will go for ‘unsubscribe from all’. You can create unsubscribe options for any language you want. These will show according to the user’s browser language. If the language isn’t in your system, it’ll show English by default. You know how important video is to the marketing mix. So it made perfect sense to integrate Upsales with one of the world’s most powerful video platforms. That’s right, you can now plug in Wistia to your Upsales account and add even more insight to your reporting. When a contact views a video, their activity can be automatically added to their profile. That way you can see at a glance how they’re interacting with your videos, what they’re interested in, and how long they watch for. Each view is submitted in Upsales as a form. These are automatically created by the Wistia app – either per form, per Wistia project or per Wistia video. 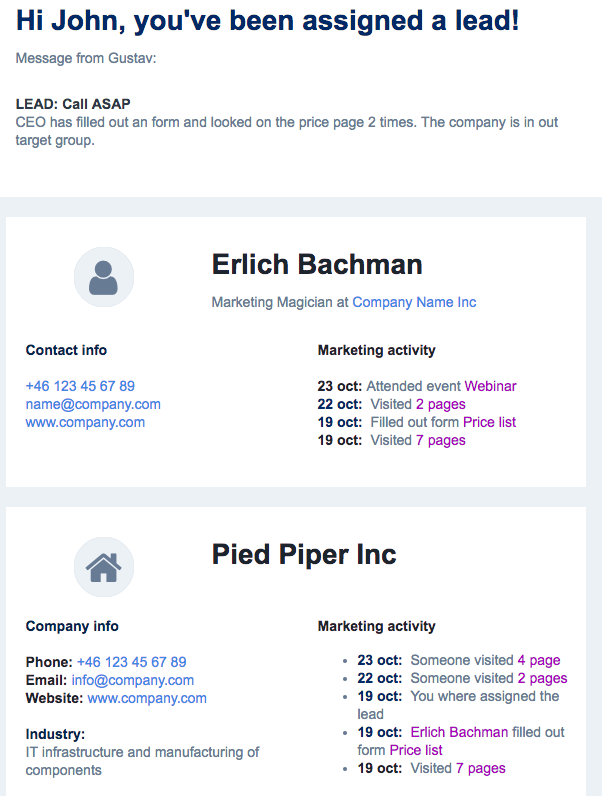 It’s now even easier to see your lead-related activity – and all in one place. Basically, we took inspiration from the things you love about the Upsales Sales board, and added them to your Marketing board. 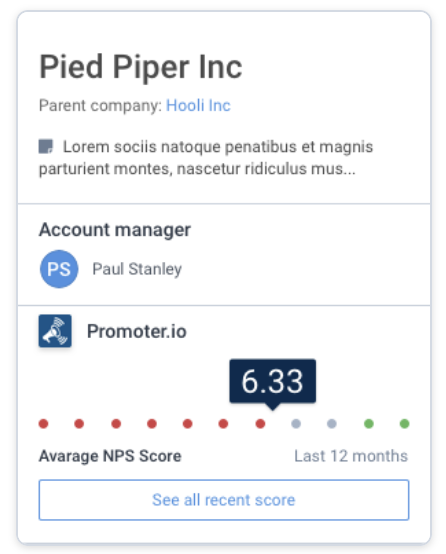 For example, you can set a time period to instantly see which companies have received a lead score. This helps you better understand performance during particular promotions or specific seasons. You can see at-a-glance where your leads are located in your funnel. Then use any of the four widgets that help you dig into your performance data. With Upsales brand new Marketing board you have a new way to see your leads. We took inspiration from Upsales Salesboard that we know you appreciate. You will find companies that have received lead score during the time period you selected. First of all, we have four widgets to help you get an overview of your marketing activities during that period. Second, we have the marketing board that shows where in your marketing- and sales process your leads are located. Great news! 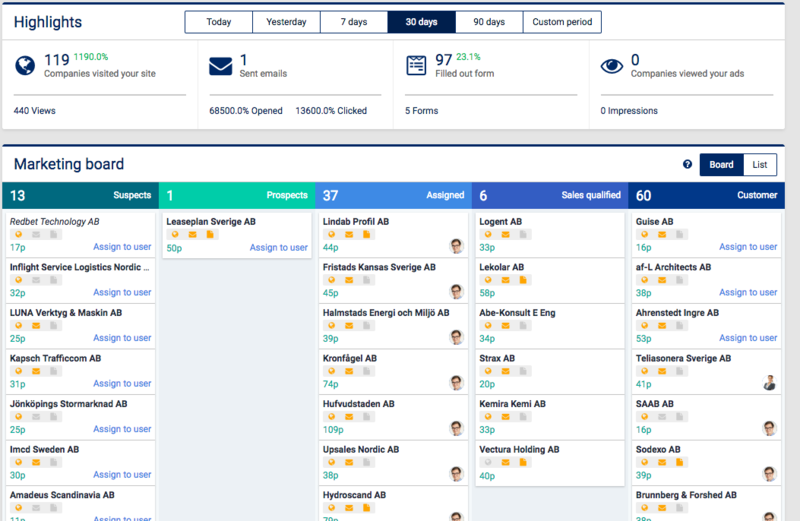 Upsales now integrates with one of Sweden’s leading accounting and invoicing apps. Use Fortnox to sync all the financial data you need, to save time when it comes to audits and reporting. For example, you can add companies, invoices, and products. 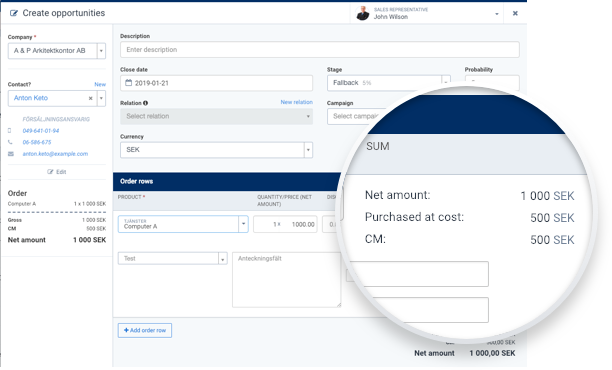 New orders and customers in Upsales will then be synced to Fortnox’s invoice or order modules, keeping your accounts clean, simple, and joined up. With the new Fortnox app that you can find in our App directory, it´s super easy to get all information (companies, invoices and products) from Fortnox to Upsales. After the initial synchronization, new orders and customers from Upsales will be synced to Fortnox, either to Fortnox Invoice- or order module. 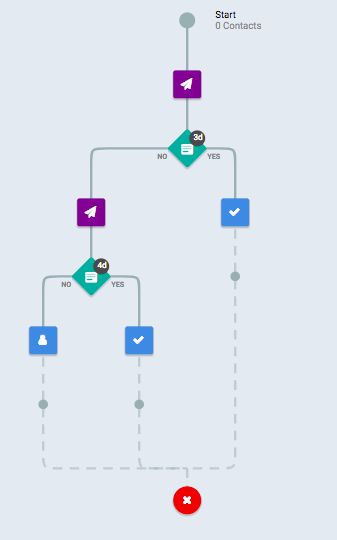 Today, we release the ability to add CRM actions into flows. 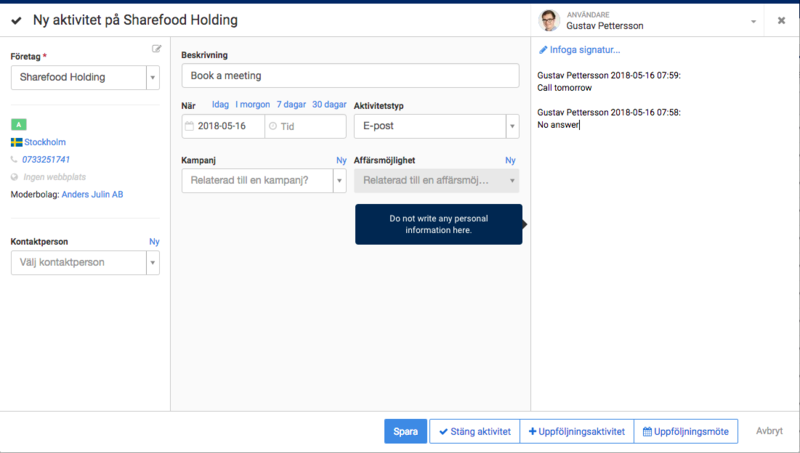 You can create activities, update companies and contacts directly through your flow. 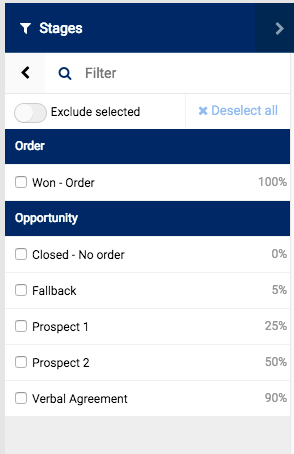 We have added the ability to filter on both order and opportunity stages in your order and opportunity list. With the help of tooltip on notes, you can create internal policies what you cannot write in you note fields. You can decide what to write in your tooltips in account settings. For many marketers, the primary focus (and concern) is delivering hot leads to sales. The hotness is typically based on lead score, which in turn is derived from the interactions the lead has had with digital assets, e.g. websites, content downloads etc. While score is great as an indicator of interest, it decays over time. Engaging leads quickly is thus crucial to secure you are leveraging the hotness. The issue many have is a too hard focus on only the NEW leads. While they definitely are important, re-engaging or recycling of leads is too. Most companies have thousands of leads, contacts and accounts sitting idling in their databases. The answer is nurturing of leads. But many simply don’t do it, Marketing Sherpa pointed out some time ago that over 70% of companies do not have a process or infrastructure for recycling leads. Often this is because of sloppy metrics and disconnected IT landscape. So how can I as CMO stay on top of both recycled and new leads? One way of looking at it is creating a “Hot Leads Quadrant”. Having discussed it for a while internally, we decided to make it happen. Let’s show all hot leads/prospects based on a score and time decay quadrant. This way we clearly see who sales should be engaging with and who we need to push from marketing. As in any quadrant – the magic happens at the top right. Next report we have released in Insight is all about the numbers. The report will help you understand how your marketing activities are performing over time.